One of the most common requests we get from our patients at Flax Dental in Atlanta is for whiter teeth. Some Atlanta patients might be interested in bleaching their teeth at home. There are many over-the-counter teeth whitening products available. Some of them can be moderately effective, but none can match the whitening power of professional-grade whitening agents. At Flax Dental, we have a couple of options for our patients. Take-home trays can be prepared individually. A lot of people like these, because they are able to do the whitening at their own pace, and as their schedule allows. They are also extremely effective, which is the best reason. Another option is our Zoom! in-office whitening. Zoom! can whiten your smile in a single office visit – about one hour. It combines peroxide gels with LED light activation to get deep into the tooth enamel and bleach away discolorations. 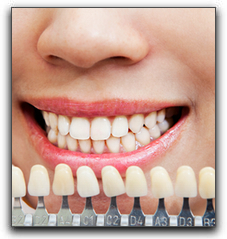 Teeth whitening from Flax Dental in Atlanta is just one of our cosmetic dentistry procedures. Call our office today to schedule an appointment.